NASA WALLOPS FLIGHT FACILITY, VA – Assembly and testing of a significantly upgraded version of Orbital ATK’s commercially developed Antares rocket has kicked into high gear and is on target for rebirth – as the clock ticks down towards its ‘Return to Flight’ by approximately mid-2016 from a launch pad at the Mid-Atlantic Regional Spaceport (MARS) in Virginia, company managers told Universe Today during a recent up close media visit to see the actual flight hardware. 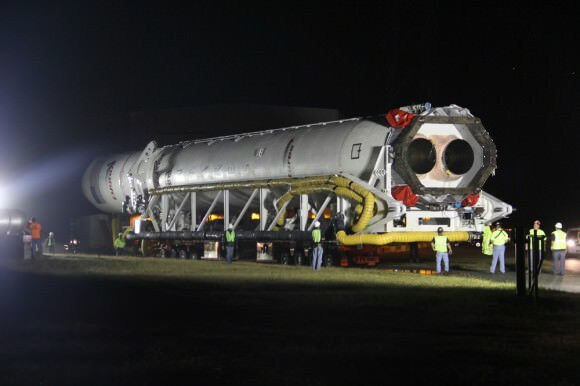 The newly merged company Orbital ATK is aiming to restart launches of their “upgraded Antares” rocket in March 2016 using completely new engines, following the catastrophic explosion on Oct. 28, 2014 that destroyed the rocket seconds after blastoff from a Virginia launch pad. Antares was carrying a Cygnus module loaded with supplies on a critical space station resupply mission for NASA. The March 2016 launch date of Antares from the Wallops Island base along Virginia’s eastern shore was announced by David Thompson, Orbital ATK, President and CEO, during a recent conference call with investors and analysts regarding the formal merger of Orbital Sciences and ATK. “The target date for that [Antares launch] is the 1st of March next year,” said Thompson. Cygnus will be fully loaded with new supplies for the station crew. The Orbital Sciences Corp. commercial Antares rocket was destroyed in a raging inferno about 15 seconds after liftoff on Oct. 28 when one of the Soviet-era built first stage engines apparently exploded and cascaded into a spectacular aerial fireball just above the launch pad 0A at NASA’s Wallops Flight Facility on the doomed Orb-3 mission carrying the Cygnus resupply module to the International Space Station (ISS). Orbital’s privately developed Cygnus pressurized cargo freighter was loaded with nearly 5000 pounds (2200 kg) of science experiments, research instruments, crew provisions, spare parts, spacewalk and computer equipment and gear on the Orb-3 mission. The module and all its contents were destroyed. Orbital established an independent accident investigation review board immediately following the launch failure. “We are about four months now into the recovery from the failure,’ said Thompson. A turbopump failure in one of the rockets Soviet-era first stage engines has been identified as the most likely cause of the Antares destruction, according to official statements from David Thompson. The AJ26 engines were originally manufactured some 40 years ago in the then Soviet Union as the NK-33. They were refurbished and “Americanized” by Aerojet Rocketdyne. After the launch failure Orbital, decided to ditch the trouble plagued AJ-26 and “re-engineered” the vehicle with new engines. The Antares first stage had been powered by a pair of the aging AJ26 engines. These will now be replaced by a pair of newly manufactured Russian RD-181 engines, assembled and purchased from NPO Energomash. Thompson said the March 2016 launch target date will be preceded by a hot fire test of the first stage engines, which is currently planned to take place in January 2015. They will not conduct a demonstration launch and have opted for a full up space station resupply flight. “We’re going to go with the cargo load on the first launch. What we are going to do in advance of that, in January of next year, is we’re going to take the first stage of Antares out to the launch pad with the new engines and do a flight readiness firing, somewhat similar to what we did back in early 2013, in advance of the first Antares flight,” said Thompson. Thompson also reiterated that Orbital will fully meet its resupply services contarct with NASA and make up for the lost cargo. The Orbital-3, or Orb-3, mission that ended in disaster on Oct 28, was to be the third of eight cargo resupply missions to the ISS through 2016 under the NASA Commercial Resupply Services (CRS) contract award valued at $1.9 Billion. Under the CRS program Orbital is to deliver 20,000 kilograms of research experiments, crew provisions, spare parts, and hardware for the eight ISS flights. Towards that end Orbital ATK has contracted with United Launch Alliance (ULA) to launch at least one and up to two Cygnus cargo missions to the International Space Station (ISS) under NASA’s Commercial Resupply Services (CRS) program. I watched the unfolding disaster first hand from the media viewing site about 1.8 miles away and filed eyewitness reports at the time. Several of my launch pad remote cameras were set up at the pad. They were impounded and the images were used by investigators during the initial investigation. They were returned to me about a month later and are featured here and in my earlier Antares reports. In the wake of last weeks disastrous failure of the Orbital Sciences commercial Antares rocket seconds after blastoff from NASA’s Wallops Flight Facility, VA, on a critical resupply mission to the space station, Orbital’s Chairman announced a comprehensive way forward involving a two pronged strategy to quickly fulfill their cargo commitments to NASA as well as upgrade the rockets’ first stage propulsion system. “Orbital announced comprehensive plans to fulfill its contract commitments under NASA’s Commercial Resupply Services (CRS) program as well as to accelerate an upgrade of the Antares medium-class launcher’s main propulsion system, the company said in a statement and discussion by David Thompson, Orbital’s Chairman and Chief Executive Officer, during an investors conference call. “Orbital is taking decisive action to fulfill our commitments to NASA in support of safe and productive operations of the Space Station,” said Thompson. A turbopump failure in one of the rockets two Aerojet Rocketdyne AJ26 engines that power the first stage has been identified by Orbital’s Accident Investigation Board (AIB) as the probable cause of the huge explosion that destroyed the booster and its NASA payload in a raging fireball after liftoff. “While still preliminary and subject to change, current evidence strongly suggests that one of the two AJ26 main engines that powered Antares first stage failed about 15 seconds after ignition. At this time, we believe the failure likely originated in or directly affected the turbopump machinery of this engine, but I want to stress that more analysis will be required to confirm that this finding is correct,” said Thompson. Overall this was the 5th Antares launch using the AJ26 engines. Thompson said Orbital is accelerating contingency planning and is looking at several alternate rocket suppliers in the US and Europe to launch Orbital’s Cygnus cargo freighter to the station. Cygnus has functioned perfectly to date and was designed to launch on other vehicles. Thompson furthermore stated that the company would need to launch one or two Cygnus spacecraft on alternate providers and hope to do so during 2015 so as to keep their CRS resupply commitments to NASA on track and with minimal delay. The next Antares/Cygnus launch from Wallops had been scheduled for no earlier than April 2015. The April launch had been scheduled to introduce the enhanced, longer Cygnus with the capability to carry a significantly heavier cargo load to the ISS. By employing the enhanced Cygnus, Orbital hopes to fulfill its entire CRS contract cargo up mass commitment to NASA in four flights instead of five by the end of 2016. “Taking advantage of the spacecraft’s flexibility, we will purchase one or two non-Antares launch vehicles for Cygnus flights in 2015 and possibly in early 2016 and combine them with several upgraded Antares rocket launches of additional Cygnus spacecraft in 2016 to deliver all remaining CRS cargo,” said Thompson. The possible launch providers include a United Launch Alliance Atlas V, a SpaceX Falcon 9 or a rocket from the European Space Agency at the Guiana Space Center. Orbital had previously announced and managers told Universe Today that the company already had decided on plans to integrate a new first stage engine in a new and upgraded second generation version of Antares. But no one at Orbital will confirm the identity of the chosen first stage engines. “We will accelerate the introduction of Antares’ upgraded propulsion system, advancing its initial launch date from the previously planned 2017 into 2016,” said Thompson. Thompson also said the AJ26 engine are unlikely to be used again without complete assurances. “Consequently, we will likely discontinue the use of the AJ26 rocket engines that had been used on the first five Antares vehicles unless and until those engines can be conclusively shown to be flight worthy,” Thompson stated. See my exclusive photos herein showing the AJ26 engines with their original NK-33 stencil, during prelaunch processing and mating to the first stage inside Orbital’s Horizontal Integration Facility (HIF) at NASA Wallops. Earlier this year an AJ26 engine failed and exploded during pre launch acceptance testing on a test stand on May 22, 2014 at NASA’s Stennis Space Center in Mississippi. The doomed mission was bound for the International Space Station (ISS) on a flight to bring up some 5000 pounds of (2200 kg) of science experiments, research instruments, crew provisions, spare parts, spacewalk and computer equipment and gear on a critical resupply mission in the Cygnus resupply ship bound for the International Space Station (ISS). Orbital Sciences is under contract to deliver 20,000 kilograms of research experiments, crew provisions, spare parts and hardware for the eight ISS flights. Watch the Antares launch disaster unfold into a raging inferno in this dramatic sequence of my photos shot on site – here. Check out my raw video of the launch – here. Read my firsthand account of the disaster as viewed from the press site, with photos – here. Watch my interview at Universe Today Weekly Space Hangout on Oct 31, 2014 -here. A Russian built rocket engine planned for future use in the first stage of Orbital Sciences Corp. commercial Antares rocket launching to the International Space Station failed during pre-launch acceptance testing on Thursday afternoon, May 22, at NASA’s Stennis Space Center in Mississippi. “There was a test failure at Stennis yesterday afternoon (May 22),” Orbital Sciences spokesman Barry Beneski told Universe Today. The Aerojet Rocketdyne AJ26 rocket engine failed with extensive damage about halfway through the planned test aimed at qualifying the engine for an Antares flight scheduled for early next year. “Engineers are examining data to determine the cause of the failure,” Beneski told me. The test was initiated at about 3:00 p.m. EDT on Thursday and the anomaly occurred approximately 30 seconds into the planned 54-second test. “It terminated prematurely, resulting in extensive damage to the engine,” Orbital said in a statement. An investigation into the incident by Aerojet and NASA has begun. The cause of the failure is not known. “During hot-fire testing on May 22 at NASA’s Stennis Space Center, Aerojet Rocketdyne’s AJ26 engine experienced a test anomaly. The company is leading an investigation to determine the cause,” Aerojet spokesperson Jessica Pieczonka told Universe Today. “There were no injuries,” Pieczonka confirmed to me. A team of NASA, Orbital Sciences Corporation, Aerojet Rocketdyne and Lockheed Martin engineers tests all of the AJ26 engines on the E-1 Test Stand at NASA’s Stennis Space Center before delivering them to the launch site at NASA’s Wallops Flight Facility in Virginia. The testing program began in November 2010. “Stennis will perform checkouts to the facility to ensure its operational integrity,” NASA Stennis spokesperson Rebecca Strecker told me. Antares first stage is powered by a pair of liquid oxygen and kerosene fueled AJ26-62 engines that deliver a combined 734,000 pounds (3265 kilonewtons) of sea level thrust. To date, the AJ26 engines have performed flawlessly through a total of three Antares launches from NASA’s Wallops Flight Facility in Virginia. They measure 3.3 meters (10.9 feet) in height and weigh 1590 kg (3,500 lb.). The next Antares rocket is slated to blastoff on June 10 with the Cygnus cargo freighter on the Orb-2 resupply mission to the ISS. As of today, it’s not known whether the June flight will have to be postponed. “It is too early to tell if upcoming Antares flights will be affected,” Beneski said. The most recent launch of the two stage rocket took place this past winter on Jan. 9, 2014 on the Orb-1 resupply mission. The AJ26 engines were originally known as the NK-33 and built in the Soviet Union for their manned moon landing program. Aerojet extensively modified, checked and tested the NK-33 engines now designated as the AJ26-62 to qualify them for use in the first stage Antares core, which is manufactured in Ukraine by the Yuznoye Design Bureau and based on the Zenit launch vehicle. “Each test of an AJ26 engine is exciting and affirming because it is in direct support of NASA’s commercial space flight efforts, as well as a continuation of a very successful Stennis partnership with Orbital and Aerojet Rocketdyne,” Stennis Director Rick Gilbrech said in an earlier statement. Orbital Sciences was awarded a $1.9 Billion supply contract by NASA to deliver 20,000 kilograms of research experiments, crew provisions, spare parts and hardware for 8 flights to the ISS through 2016 under the Commercial Resupply Services (CRS) initiative. The June mission would be the second operational Antares/Cygnus flight. SpaceX has a similar resupply contract using their Falcon 9 rocket and Dragon cargo carrier and just completed their 3rd operational mission to the ISS.